Palm Sunday begins our observance of Holy Week, the Week of Salvation. The reading of the Lord’s Passion marks the beginning of our observances of the great mysteries of our faith and life. We have been preparing for this week since the beginning of Lent; and now we have at last arrived at the most important week of the year spiritually speaking. As you pastor, I exhort you and encourage you to participate devoutly at all of the Holy Week Masses and Services, especially the Passover of the Lord, the Sacred Paschal Triduum which begins on Holy Thursday with the Mass of the Lord’s Supper. This is a time of special grace and Our Lord wishes to bestow on us particular graces and a deeper understanding of these divine realities. Our meditations in the coming days will focus on this word: reality, the state of things as they actually exist, as opposed to a notional idea of them. We know well that our weekly and daily celebrations of the Sacred Mysteries, and specifically the Holy Sacrifice of the Mass are a sacred action (actio, synaxis); the action of God Himself who wills that in union with the Sacrifice of His Son on the Cross, our own lives become a fragrant offering. So the Apostle exhorts us: I appeal to you therefore, brethren, by the mercies of God, to present your bodies as a living sacrifice, holy and acceptable to God, which is your spiritual worship. Do not be conformed to this world but be transformed by the renewal of your mind (Rom. 12:1-2). St. Gregory Nazianzen further exhorts us: Let us take our part in the Passover prescribed by the law, not in a literal way, but according to the teaching of the Gospel….We must sacrifice ourselves to God, each day and in everything we do, accepting all that happens to us for the sake of the Word, imitating his passion by our sufferings, and honouring his blood by shedding our own. We must be ready to be crucified (Oratio 45, The Liturgy of the Hours, Vol. II, p. 392-393). We must be ready to be crucified. These are stark words, frightening even; yet, they are the possible consequence for anyone who has heeded Our Lord’s call: ‘If any man would come after me, let him deny himself and take up his cross daily and follow me’ (Lk. 9:23). The Cross, and more correctly the Crucifix is the reality that determines our identity. 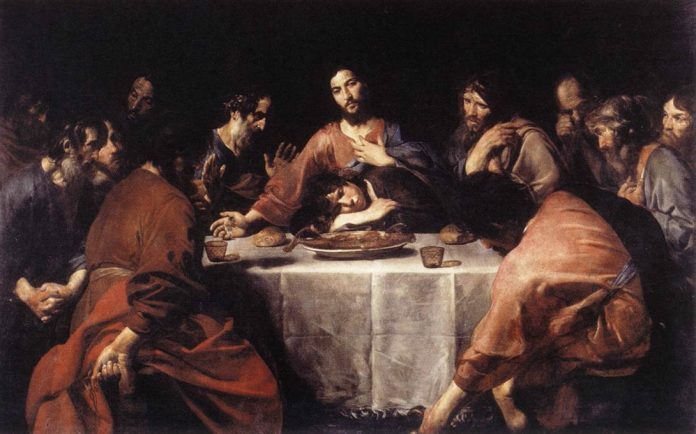 It was at the Last Supper which we will commemorate on Holy Thursday, not by re-enacting it, but in the sacramental reality of God’s grace, that Our Lord left us the Sacrament of His Sacrifice on the Cross. What is begun on Holy Thursday is completed on Good Friday on the Altar of the Cross. And this is the Reality that is the foundation of our Christian faith and life. The Word of God, the Second Person of the Most Holy Trinity has redeemed us and He is our all. By His birth He gave Himself as our companion; At the Last Supper He gave Himself as our food; Dying on the Cross He gave Himself as our ransom; Reigning in Heaven He gives Himself as our reward (St. Thomas Aquinas, Verbum Supernum prodiens). The reality of His Real Presence is the foundation of our Christian life and on Holy Thursday with great solemnity we will recall the gift of the Church’s greatest treasure, the Holy Eucharist. Let us resolve to deepen our prayer and recollection during this Holy Week so that we might be all the more aware of Our Lord’s nearness to us in the Most Blessed Sacrament of the Altar in which the memory of His Sacred Passion is recalled, the soul is filled with grace and to us is given a pledge of our future glory. When our Eucharistic faith is strong, so is the Church; and therefore all the more effective in proclaiming the truth of the Gospel. On the Altar you see the chalice veiled for the Sacrifice. The red veil that covers it was once used in the private chapel by the greatest Pope of the last century, Pope St. Pius X. And I, unworthy as I am, am privileged not only to have these sacred objects in our parish this Palm Sunday, but also to be able to wear a stole once worn by Pope St. Pius X. Divine Providence has arranged for us to have these sacred objects here as we begin Holy Week; perhaps as an encouragement for all of us to renew as fervently as we can our personal resolve to live an authentically Eucharistic life; a life based on the reality of God’s Real Presence among us in the Most Blessed Sacrament of the Altar. Pope St. Pius X is known as the Pope of the Holy Eucharist because he lowered the age for the reception of this Sacrament and encouraged frequent Communion. He is no less known as the great Defender of the truth of the Catholic Faith against the heresy of modernism which today threatens both Church and society. The instability of our times has its origin in the relativism of the modernist heresy which has given rise to a dictatorship of relativism which does not recognize anything as definitive and whose ultimate goal consists solely of satisfying the desires of one’s own ego (Pope Benedict XVI). That is quite the assessment of the merciless dictatorship of relativism where using the wrong pronoun in the presence of those whose sense of reality is at best notional can cost you your job. Beware of the power of the ego.